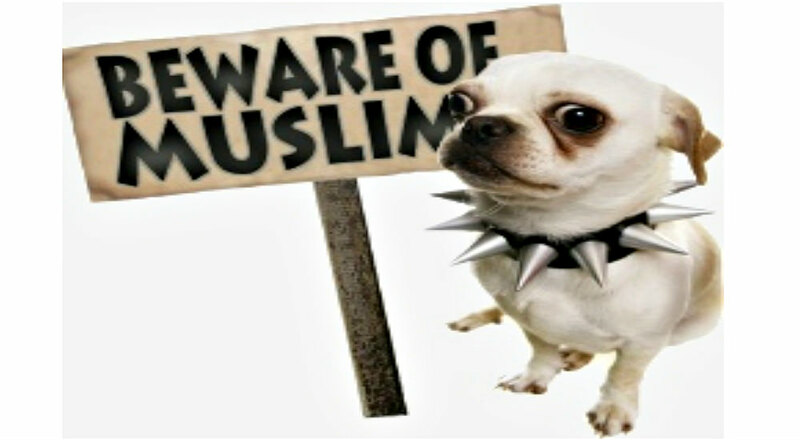 Muslim Hate Crimes Against Dogs on the Rise in the West! There is a Muslim ‘campaign’ to ban dogs in public places. This includes the White House. But the very name of General “Mad Dog” Mattis lets unvetted Muslims know where Washington stands on this issue. In this regard, Sharia Law has already been imposed on American blind people in all fifty states. Cold heartedly, Muslim taxi drivers refuse to pick up blind people – even those standing for hours in rain and storm – when their seeing-eye dogs are with them. One blind person with a seeing-eye dog noted over fifty cabs, with Muslim cab drivers, passed by him one day. This is a daily Sharia experience imposed on blind people! Indeed, in North America and Europe, blind or disabled people accompanied by dogs face Muslim hostility in hospitals, supermarkets and from Muslim bus passengers and turned away from restaurants; Western citizens not going along with this are even handcuffed and threatened with arrest! And yet, God only knows how many of these Muslim cab drivers received terrorist car-bomb training, before coming to America. Tehran, Khartoum and Damascus are the three top Muslim training centers for car-bomb training. Every taxi in their hands is a potential weapon! Yes, Damascus, Syria, from where North America receives hundreds of thousands of unvetted Muslim “refugees.” How many of these boast car-bomb training from Tehran, Khartoum and, especially Damascus? No wonder this potential Muslim terror force fears American dogs! In 2015, city councilor Hasan Küçük of The Hague called for dog ownership to be made illegal in that city. Imagine. Great European cities with great European paintings, including dogs through the centuries, now confronted with dog ownership as illegal. The next wave of sordid Muslim iconoclasm, following the desecration of venerated Christian statues, will be the eradication and prohibition of artwork containing dogs. But no longer are American cities threatened! President-elect Trump owns a very, very powerful dog, General “Mad Dog” Mattis. The general will remain entirely legal in all American cities and the greatest of All American public places, Washington DC! Islamic activists in Lérida, Spain, lobbied for dogs to be kept out of Muslim neighborhoods, saying their presence violated Muslims’ religious freedom. However, things will be quite different in American neighborhoods, where dogs will search for an initial 3 million unvetted Muslims. In Britain, police sniffer dogs are “carefully” used, and are not permitted to contact passengers, only their luggage. They are required to wear leather dog booties when searching mosques or Muslim homes. Leather dog booties! And yet the Muslim bombings and violent rapings are unrestrained. ISIS now is even allowed to meet in London’s parks! The opinions expressed in this commentary are solely those of the author and are not not necessarily either shared or endorsed by iPatriot.com. Obama Agrees with President Trump… Again!